Educators should examine the site in advance and look at different ranges of data. Instead of just watching the animation, have students take data over a one-year period and also over a 20 year time interval. Then, have students construct graphs of their data and have a class discussion about their results. Integrating a tool like this into a curriculum is a great way to get students involved in long-term data sets as they interact with the tool to observe changes. The changes in sea ice extent in the northern and southern hemispheres allow students to observe trends and compare patterns in the two polar regions. Shows an important and fast-changing component of the system (Arctic sea ice). Data begins in 1979 and continues to the present. New data is added to the tool, so relevant as a 'reality' component in a curriculum. Detailed documentation shows how to use the tool for comparing anomalies and trends. Individual images and data can also be downloaded. Comment from expert scientist: Science is state-of-the-art as it stands. However, the interface is kind of clunky, and the documentation is definitely too technical and dense (for a non-scientist teenager for example). However, it definitely has all the capabilities necessary for thoughtful, patient people who don't mind a 'clunky' interface, to nicely explore sea ice variability. 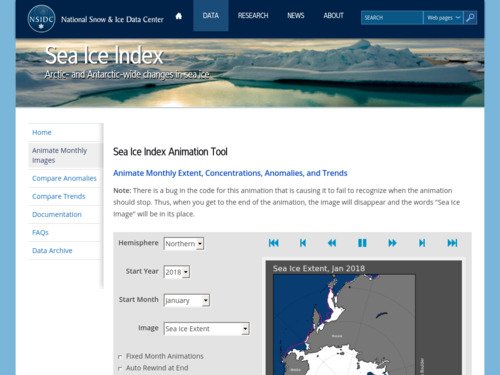 Students interact with this animation to select the timeframe and location of sea ice extent (northern and southern hemisphere, month and year), and compare that to the median ice edge shown as a pink/purple line. Students and teachers can interact in a variety of ways to learn about the changes in sea ice over time. Visualization could be improved by providing more instructions on how to use this tool.